Although there are many different processes for cleaning buildings, one of our best methods is sponge blasting. This is a highly effective technique which takes advantage of the very latest current technology and applications in industrial abrasive cleaning; sponge blasting is unique amongst other available cleaning methods for this reason. The technique has been designed with speed in mind, aiming to get the job done quickly but without compromising on quality. In addition, sponge blasting can help with the restoration of historic buildings, restoring worn or neglected buildings to their former glory in next to no time at all! What Are the Benefits of Sponge Blasting? Also, sponge blasting is an extremely varied technique, offering surface preparation as well as cleaning the exterior of the building. This method can also be used to help with decontamination and selective stripping of individual layers of coatings from delicate substrates whilst avoiding causing any damage to the substrate itself. Functional and extremely versatile, sponge blasting is an abrasive cleaning method which can easily be applied to a wide range of sectors. From industrial applications to the restoration of historic buildings, sponge blasting can help to achieve a highly satisfactory end result. Sponge blast media, which varies according to the intended surface to be cleaned, includes abrasives ideal for creating a top surface quality. It is best suited to applications such as railway rolling stock maintenance, pipeline inspection projects, ship repair work, nuclear decontamination and rust removal in industrial settings. 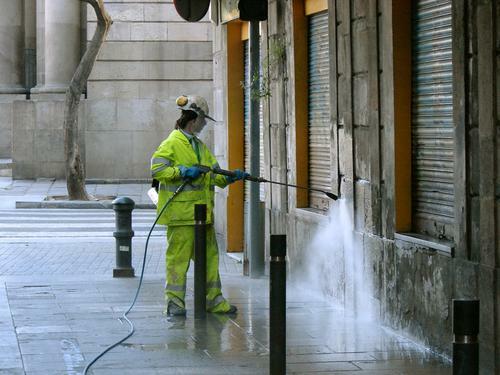 Similarly, sponge blast media can also be used for a range of cleaning processes including the removal of graffiti, pollution and soot from buildings. During the process, this media will be poured into a blast feed unit, where it is stirred before being fed through the system, in a variable pressure air stream, through the hose, and finally into the blast nozzle. The media will then hit the surface at 15-100 metres per second, dependent on the blast pressure. It is this impact of the particles on the surface which will clean the desired area. One of the main benefits of sponge blasting in comparison to other industrial cleaning techniques is the fact that sponge blast media generates less than 10% of the airborne dust levels created through other forms of grit blasting media. Not only is this a more environmentally-friendly process, but it is also beneficial when it comes to health and safety. For more information about the sponge blasting process and its uses in industry and the restoration of historic buildings, please give a member of our team a call today on 01733 560362.